Cut flowers age rapidly in the presence of regular lighting. In addition, photochemical processes lead to the creation of ethylene, which rapidly spoils floral products. With high levels of merchandising impact and reduced levels of the damaging portions of visible and invisible light spectra, Safe Spectrum® is ideal for floral displays. Ethylene rapidly spoils floral products. 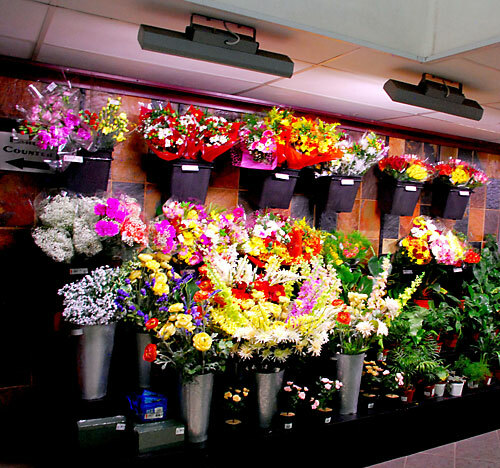 Floral departments and florists require low heat, low radiation lighting to keep cut flowers and bouquets looking fresh and colorful for days. Typically shoppers will buy flowers for those very special occasions (birthdays, anniversaries and holidays) otherwise it is an impulse buy. And what better way to entice shoppers than with a bounty of color and the sweet floral scent of fresh flowers.